SOLiD, a wireless infrastructure company, introduced today the ALLIANCE 2W LROU, a two-watt DAS amplifier with a new, compact, energy efficient design. With this addition, the SOLiD product line offers the most flexible, modular approach to DAS network design available, including 1-watt, 2-watt, 5-watt and 20-watt ROUs (remote optical units). “With the debut of the ALLIANCE 2W, network designers can choose exactly the right amplifier power, size and configuration for their needs, whether they are designing for a stadium-sized venue or for a middleprise building such as a hotel. This flexibility delivers lower total cost of ownership and optimum performance of the network,” said Ken Sandfeld, President of SOLiD Americas. SOLiD’s ALLIANCE is a multi-operator DAS solution that supports commercial wireless, public-safety, two-way radio services all delivered over a single fiber. Modular design means lower operational costs and unparalleled RF performance, cost efficiency and flexibility. The product’s rugged construction meets the latest fire codes and requirements for harsh environmental conditions. Unique modular design – Customers can cost-effectively expand and upgrade the unit to support new frequencies as needs evolve, by swapping out a single component, without removing and re-installing the unit. The ALLIANCE 2W supports the AWS-1 and AWS-3 band today, as well as legacy bands (700, 800/850, 1900, 2100) and can be easily updated for new bands such as 2.5 and 2.3 (WCS). Superior energy efficiency – The ALLIANCE 2W LROU is designed for energy-efficient operation. Power consumption for the ALLIANCE 2W LROU is approximately 155W for five bands and 240W for six bands. Output powers range from 32 to 33dBM. 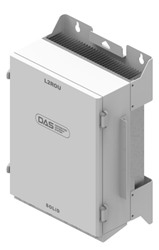 More power in a compact unit – Only 19 inches on each side, making it adaptable to constrained spaces, the new L2ROU enclosure incorporates a simplified and compact NEMA 4 design. Up to three amplifiers can be installed, depending on the environment, and the unit can be mounted on a wall or ceiling. Built to withstand harsh conditions – All of SOLiD’s DAS remotes are NEMA 4 rated and rugged enough to handle the harshest conditions, including vibration, moisture, and temperature fluctuations. Ready to scale -- Because SOLiD solutions are modular in design and use fiber cable efficiently, the DAS network can be quickly and cost-effectively scaled to support additional wireless operators and new frequencies as they are added to the system. The ALLIANCE 2W LROU is available now. For further information, please visit SOLiD at http://www.solid.com. SOLiD (http://www.solid.com) helps keep people stay connected and safe in a rapidly-changing world through a portfolio of RF Amplifier, RF Radio and Optical Transport solutions. SOLiD enables indoor and outdoor cellular and public-safety communications at some of the world’s best-known and most challenging venues including leading hospitals; professional, and college sports venues; government, university and Fortune 500 corporate buildings and campuses; international airports and metropolitan subways; and other high-profile sites. For further information on SOLiD DAS, Backhaul and Fronthaul solutions, go to http://www.solid.com or call 888-409-9997.